The Cel-Fi GO X Smart Signal Booster is a premium mobile phone signal booster that strengthens your 3G and 4G signal coverage on Vodafone, Three, EE, O2 and many other networks. It is the first carrier-class indoor/outdoor mobile coverage solution to feature industry leading 100dB signal gain and Nextivity’s unconditionally network safe guarantee. 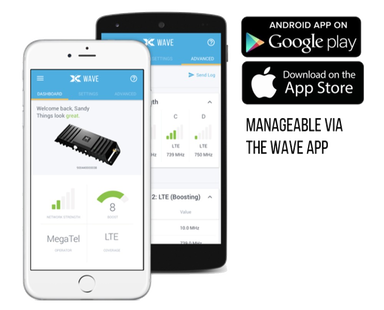 Cel-Fi GO X leverages the award winning Intelliboost signal processing to deliver the industry’s largest coverage footprint with the best voice and data wireless performance. Multi-carrier support with carrier switching via WAVE APP. Indoor/outdoor IP66 rated. Requires professional installation. ​Requires Main External Wide Band Aerial and Indoor Transmitter plus Cabling Installation. Mobile Phone Signal Boosters 4G Vodafone, O2, Three or EE.